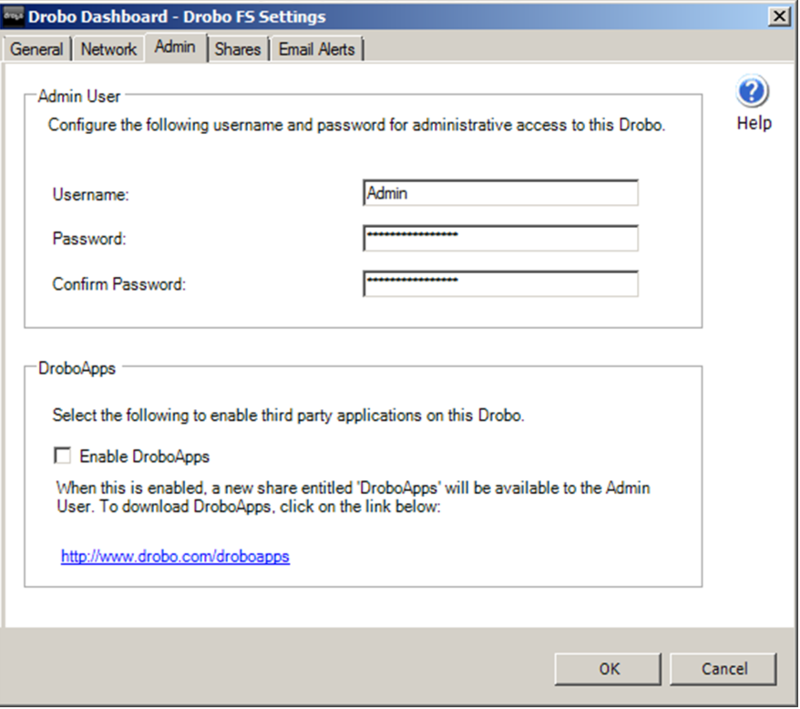 After following the instructions on the DroboApps website: (http://www.drobo.com/droboapps), I installed Apache and the DroboApps Admin Utility. 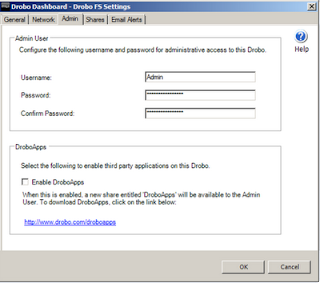 Using the DroboApps Admin Utility, I installed the Firefly application. 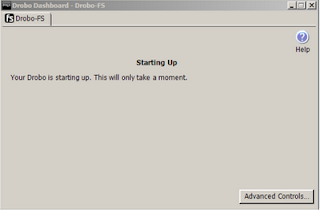 I then changed the server name and the default password, and I was up and running. 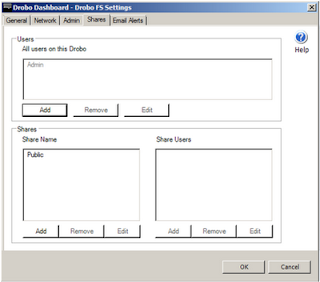 Browsing to the DroboApps share, I dropped my music into the media folder within the Firefly folder. It seems that my software firewall was not allowing TCP port 3689 and UDP port 5353. Once opened up, iTunes instantly found the shared library. All my music is currently being moved off my netbook, into the secure and resilient environment of the Drobo. The hardware was very easy to put together, and the software was just as simple to set up. There are a lot of screenshots here, but you can see it was pretty much a case of "next, next, next" to get the dashboard installed. Once installed, you will have the dashboard up and running. 1. 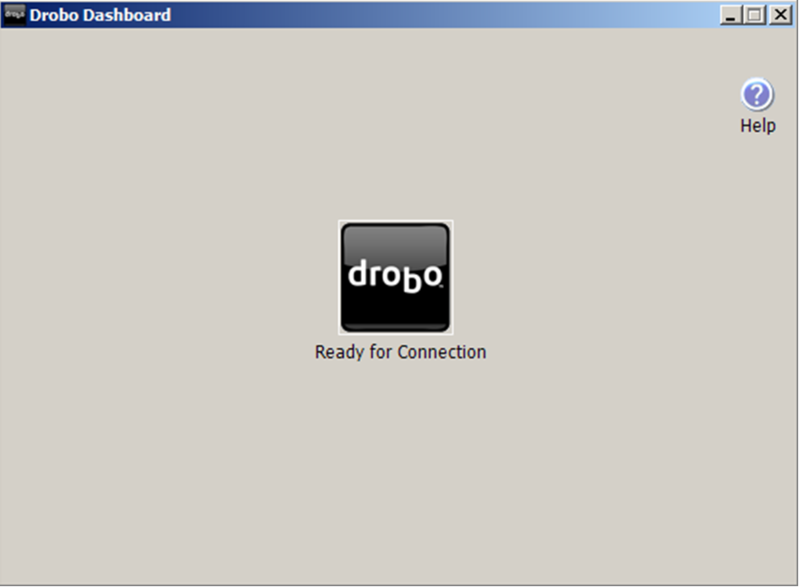 Once the Drobo Dashboard software is installed and running, it is looking for Drobo devices. 3. Clicking on the "Advanced controls" and looking at the "Data" tab, I can see what is in the device and it has correctly identified my four 1TB 3.5" SATA hard drives. 4. 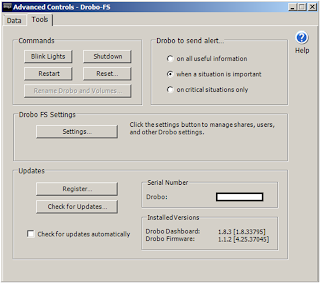 The "Tools" tab, offers a number of commands, alert settings, device settings and updates. 5. 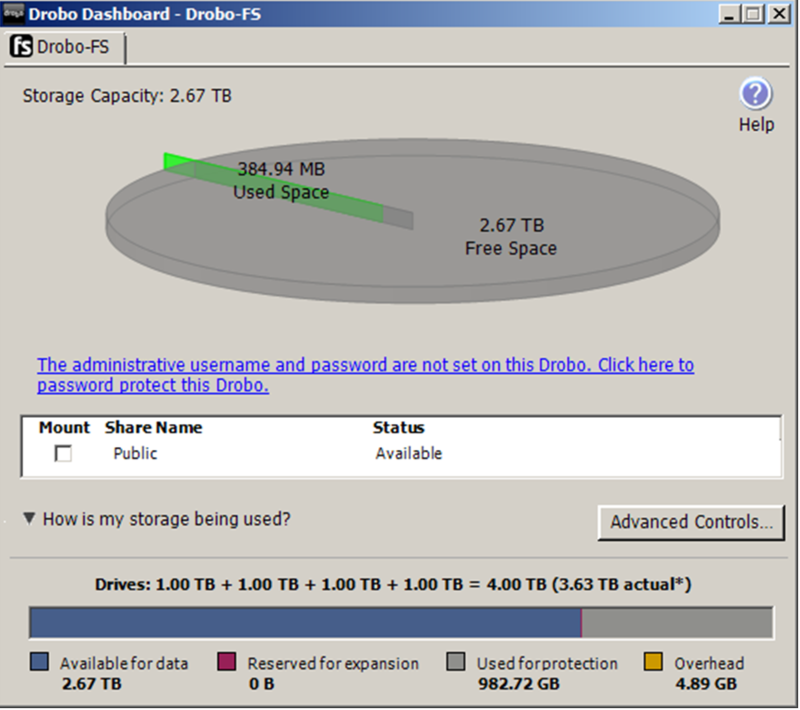 The dashboard shows how much free space I have and the shares available. 6. Expanding the "How is my storage being used?" 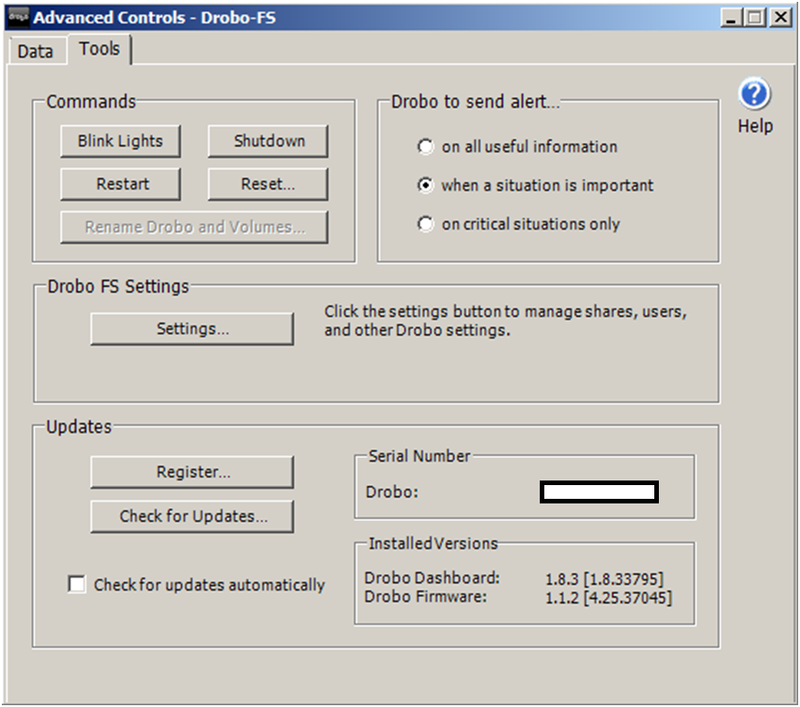 shows more drive information. 7. 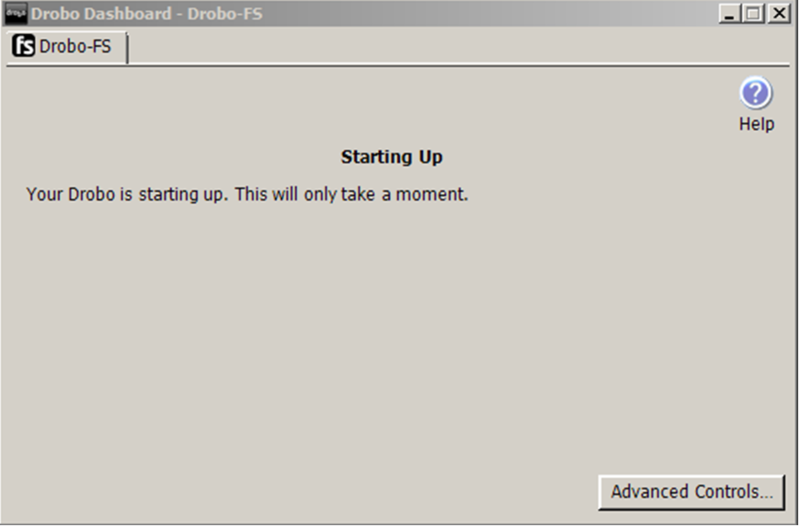 As I selected the option to check for updates, this box somes up. 9. 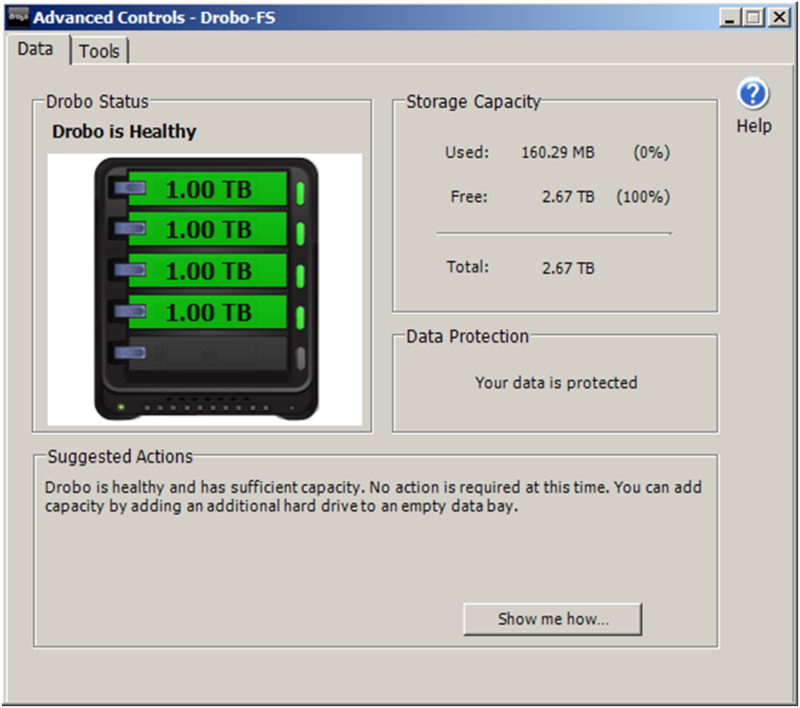 By default, the Drobo device will protect your data in the event of one hard drive failing. 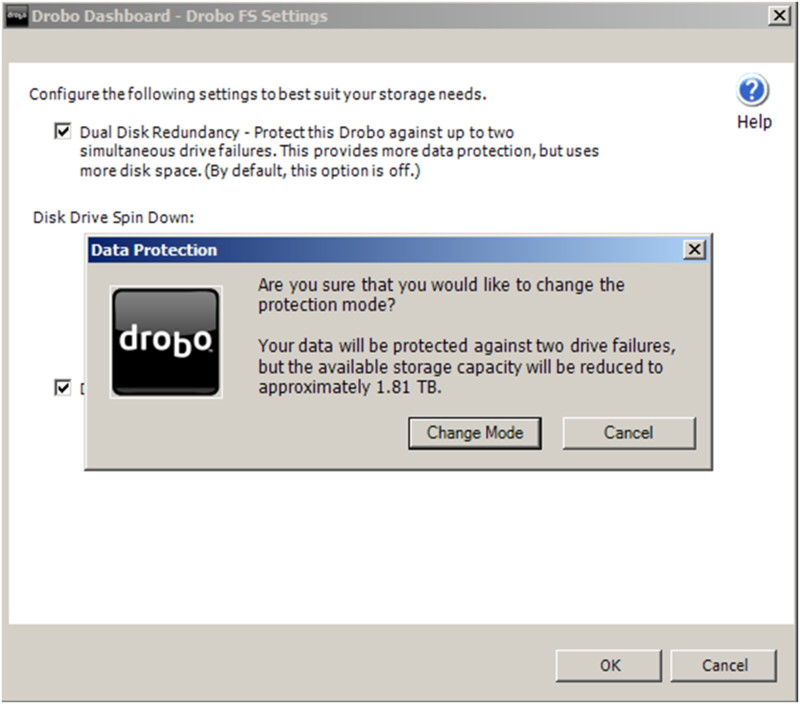 There is a option to enable dual disk redundancy, which will protect the data in the event of two drives failing. 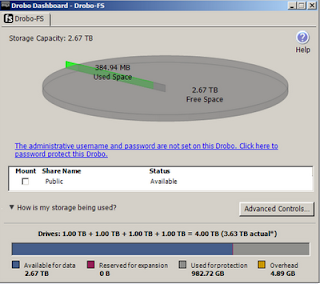 It does use more hard disk space, but I guess it depends how important you data is. As my device will be holding family photos and my MP3s, I will be enabling the dual drive redundancy. 10. 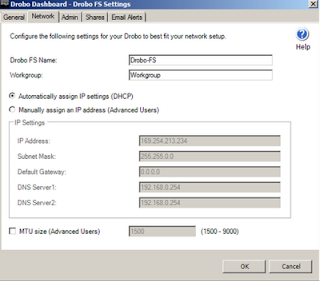 On the "Network" tab, the network settings can be configured. I will be setting this to match my internal network. 11. 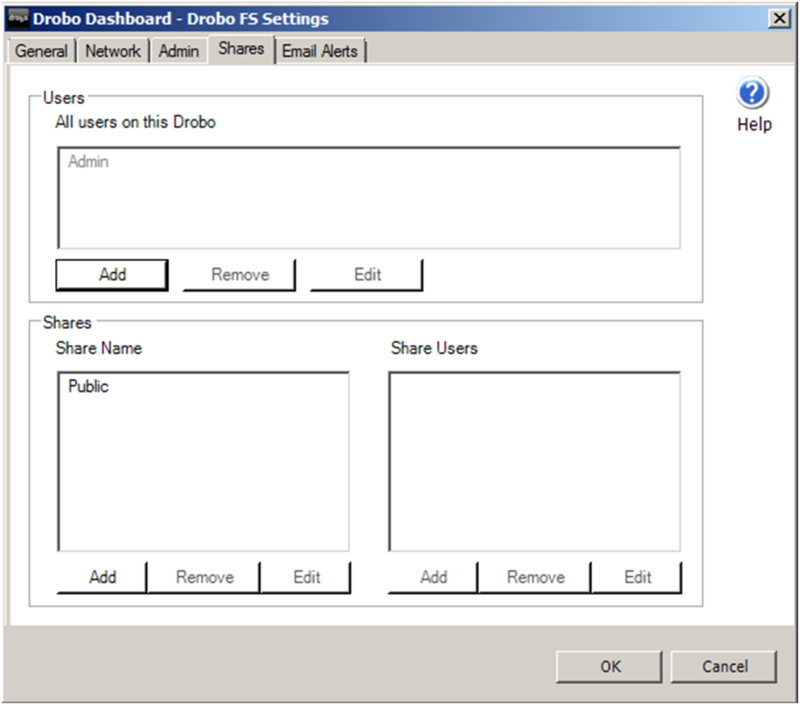 On the "Shares" tab, shares and users can be created. By default, you have one share called "Public" and the administrative user called "Admin" by default. 13. 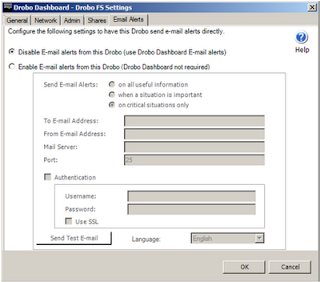 On the "Email Alerts" tab, the email server information can be configured. I had a surprise at work today, as a box was left on my desk. Drobo kindly shipped a Drobo FS to me to test and use. 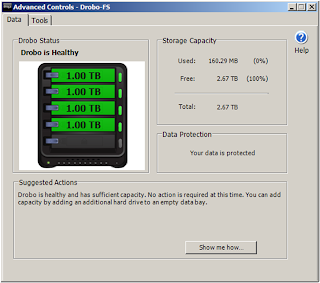 At e92plus, we have just started distributing the Drobo range of products and like any technical person, the technology interested me, but hands on experience with a product is much more fun! 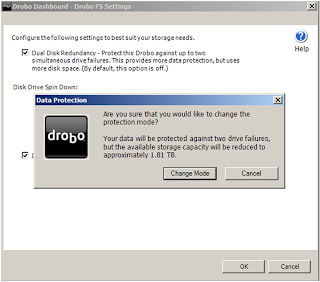 A number of things drew my attention to the Data Robotics (Drobo) range of drive enclosures, even before we signed them up to distribute their products. I was aware that different makes and sizes of hard drives could be used within one enclosure. This goes against the things that I have learnt about RAID technology and have been using for over 17 years, but then again RAID is over 25 years old!! 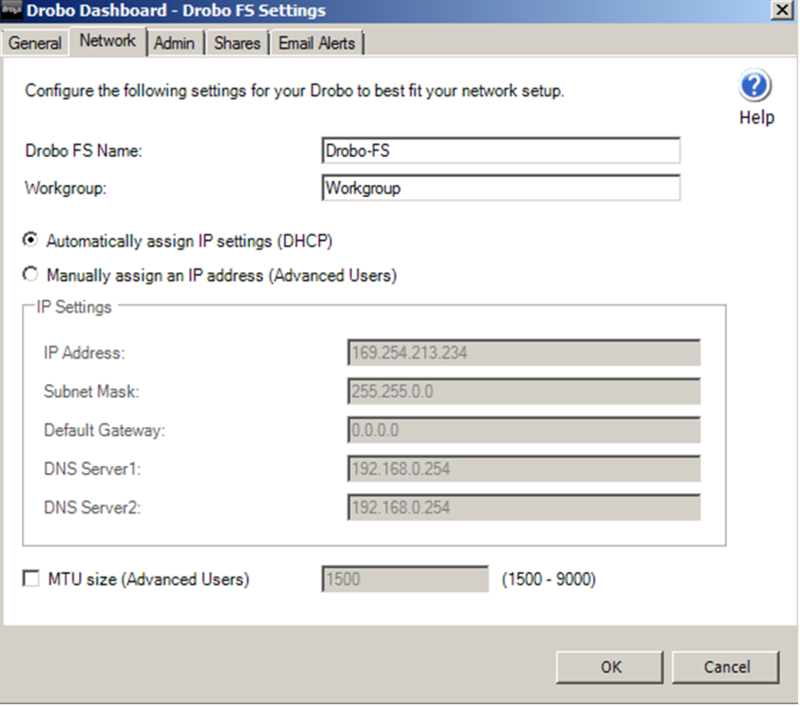 I was also aware that some of the Drobo range would allow applications (Drobo Apps) to be run on the device, so it could be a web server, FTP server, iTunes server, etc. 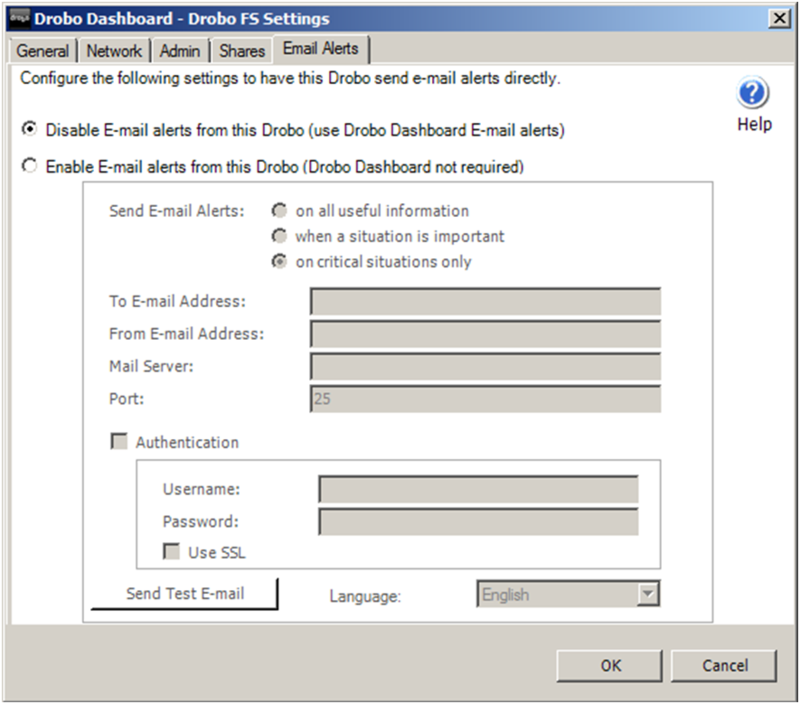 There was a boast that it was easy to set up without the complex configuration normally associated with RAID systems. I think I had a head start as I have worked with RAID for a number of years, as well as already owning a Netgear NAS appliance at home. I've been looking to replace this with a device that support the storage of an iTunes library, which my current device does not do. 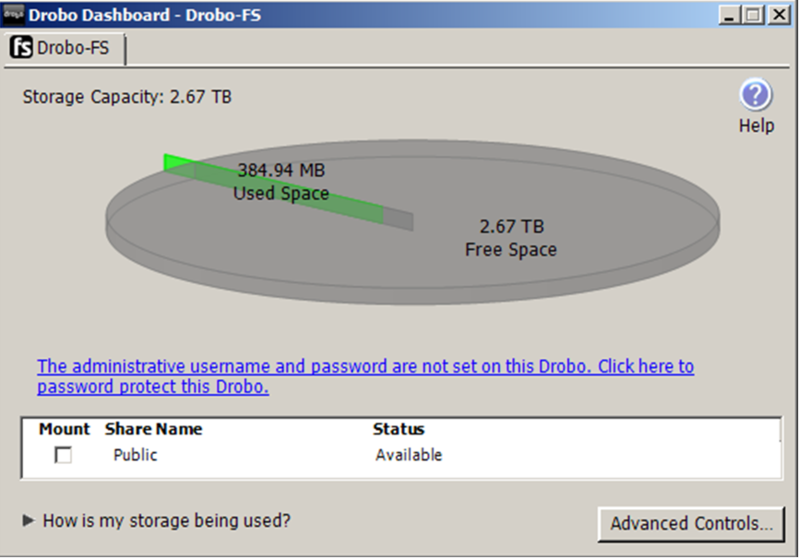 After plenty of research, I came to the conclusion that I need a Drobo FS at home, and all of this was decided before I was even aware of it at work. It was good to see that something I had researched a while ago was not only good enough for home, but have a number of devices suitable for business uses. The device is very attractive, metal chassis and a plastic front bezel, held on with magnets. It has a very good blend of aesthetics with a quality/sturdy build quality. It felt very solid compared to the my existing NAS appliance. I had four 1TB SATA hard drives spare, so this is what I'm using as part of this test.